New Squarespace 6 websites are showing up more and more frequently on the web these days, and demand for the web publishing platform has spiked even more dramatically in the last six months since the Squarespace 6 platform was released. It's no wonder then that nine fresh new Squarespace websites were submitted for the last Squarespace Website Showcase addition in 2012. The sites range from musicians to career consultants to rental services and more. Be inspired by these new beauts, and be sure to submit your Squarespace creations if you'd like to be featured next month. Auction Block TV - Interested in going to more real estate auctions, but you don't want to leave your home? Auction Block TV can help, thanks to this Squarespace 6 design by Shane Boyce of GetBoyce.com. Big Money Gators - Mark Gilmore and his band, Big Money Gators, use their Squarespace 6 website to promote their music, videos, and event calendar. Maggie McGary - MaggieMcGary.com was designed by Daniel Agee, but Maggie was so happy with it that she submitted it to the showcase herself. This fine Squarespace 6 blog is simple, yet effective and clean. OrgWell - Joshua Neimark designed this Squarespace 6 website for Australian wellness and wellbeing consultancy of Jen Rutherford. Jamie Brittain - UK web designer and front-end developer Jamie Brittain has been a fan of Squarespace and a friend of this blog for quite some time. His new Squarespace 6 site is super minimalist and pleasant. Nickell Rental - Our friend Shane Boyce of Boyce Design used the new Squarespace 6 business templates to build a full catalog of large equipment as my favorite part of this Squarespace website. 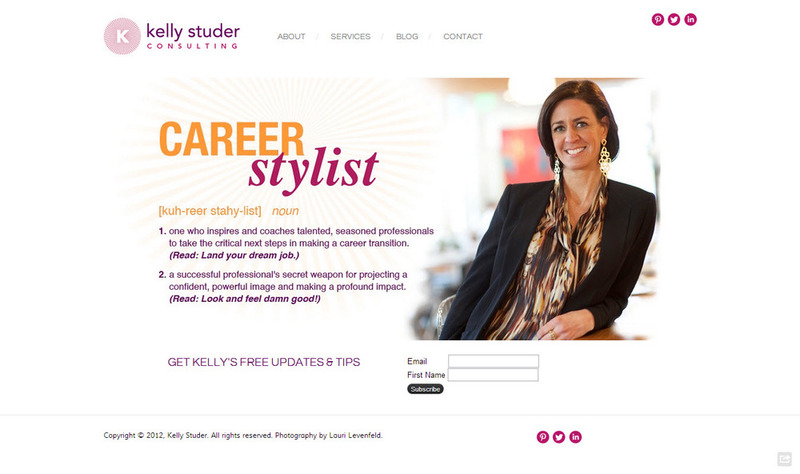 Kelly Studer Consulting - The "Career Stylist" Kelly Studer trusted Joshua Neimark to build this wonderful small business website on Squarespace 6, featuring a strong homepage with an integrated social media and email sign-up. Balifornian - Maryam is from Bali and Michael is from California, and together they're known as Balifornian, and they're constructing a wellness retreat center in Ketewel, Bali. Antique Furniture Restoration Courses - Joshua Neimark developed this Squarespace website to help demonstrate the value and sell John Tope's antique furniture restoration video courses. Which website did you like the best? What ideas do these websites give you for your own Squarespace website redesign project? I'd love to hear your thoughts in the comments, and please do submit your own creations if you're inspired to create a Squarespace site this month.